Organizations continue to embark on the digital transformation journey moving from centralized data centers to hyper distributed applications to drive improved business outcomes and create better customer experiences. The distributed infrastructure, however, engenders a new level of networking and security challenges which arise due to the complex networks within them. There are more entryways and points of interaction, which makes the network an easy target for cyber threats and data breaches. VMware, the pioneer and trusted platform provider of virtualization software and services recently unveiled what it envisions to be the future of networking—Virtual Cloud Network. With a Virtual Cloud Network, VMware provides organizations with pervasive, end-to-end secure connectivity for apps and data, wherever they are—data center, cloud, or at the edge. Built on VMware’s NSX—VMware’s SDN network virtualization and security platform, the Virtual Cloud Network enables organizations to create a digital business fabric for connecting and securing applications, data, and users across the entire network. The Virtual Cloud Network along with VMware’s Network Functions Virtualization (NFV) platform—vCloud NFV OpenStack edition 3.0 delivers breakthrough improvements in network performance, new carrier-grade networking capabilities, and intent-based service assurance to help improve the total economics of software-defined, open standards-based 5G and multi-cloud telco networks. Today’s market is abounding with VMware solution providers that have created numerous innovative solutions that can help companies tackle challenges in the VMware landscape. From consultation services to implementation assistance, these solution providers are constantly transforming the VMware market. A distinguished panel comprising CEOs, CIOs and analysts along with CIOReview's editorial board have narrowed down VMware solution providers that exhibit competence and are at the vanguard fulfilling the incessant demands of the industry. 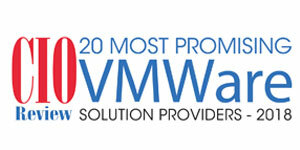 We present to you CIOReview's 20 Most Promising VMware Solution Providers - 2018.